LOCATION: "Wintertide" is located 500ft from the private beach access. DETAILS: 94 Miami Street also known as "Wintertide" is ideally situated in Frangista Beach and boasts exemplary coastal design throughout. Outfitted with seven bedrooms and six full bathrooms, notable features include an open floor-plan with multiple living areas, private elevator, and two spacious master suites with ensuite bathrooms. The finely appointed, gourmet kitchen with a large center island and top-of-the-line appliances, are perfect for preparing a meal for your large group. Adjacent to the kitchen is a dual dining room and living area allowing for optimal comfort and plenty of gathering space. The enormous rear patio is easily accessible and ideal for entertaining with a covered outdoor kitchen and grill as well as a massive pool and spa area, all encompassed by a privacy wall juxtaposed with lush tropical landscaping. Located within close proximity to gated deeded beach access as well as world class shopping, dining and entertainment, 94 Miami Street is perfect for you next extraordinary beach vacation! 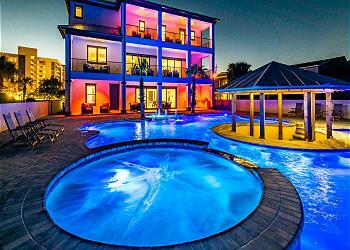 Book your next vacation at "Wintertide" with 360 Blue today! OTHER AMENITIES INCLUDE: 7 adult bikes, 6 seater golf cart, large private heated pool. This property comes with 3-4 dedicated parking spots outside of the garage in the driveway. Complete Clean Linen Participant - ALL linens, including comforters laundered upon every checkout. 360 Blue was awesome to work with! House was immaculate! Pool was great. House has everything needed! Thank you so much for the kind words! We are so glad that you enjoyed your stay with us at Miramar Beach! We hope to see you at the beach again soon! Loved our time here. Thought about doing multiple condos but didn’t want to miss the late-night games and early morning coffee together. This house was perfect- except for the jackhammering/construction next door! We are four adult siblings w our spouses, parents and children so we ranged in age from 3-83! We celebrated a 50th birthday and a 17th birthday. We spent very lIttle time on the beach due to the thick fog and stormy skies... but one of us commented that the fog served as a blanket surrounding us w love! We thank you for your hospitality! We are so glad that you enjoyed your stay with us in Miramar Beach! We agree that this home perfectly accommodates everyone! Thank you for staying with 360 Blue, we hope to see you again soon! It was my 50th birthday weekend and I wanted to go someplace to relax and have fun. My daughter, two sisters, and 8 amazing friends made it a wonderful weekend and this house was perfect for the occasion. 360 Blue was great in dealing with anything we needed help with. 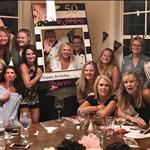 We are so thrilled that you enjoyed celebrating your 50th birthday with us in Miramar Beach! We especially loved the photo you shared with us, it looks like you all had a blast! We look forward to hosting you all again very soon! The home was beautiful, the pool & hot tub relaxing! We loved having a golf cart to cruise around in along with the bikes to ride wherever we needed. Our party of 16 ranged in age from 88 down to 3 so having an elevator along with a high chair was perfect! The one issue we had with cue sticks not having tips was resolved immediately by the property mgmt who brought over a couple replacements. This was our first family vacation and we can’t wait to do it again next year! What a beautiful family photo! We are so happy you were able to create so many wonderful memories in Miramar Beach! We are thrilled we were able to resolve the pool cue issue so quickly! Thank you so much for choosing to stay with 360 Blue and we hope to have you back again soon! Amazing property. Game room with nice pool table, kitchen with large island, and good sized pool were excellent. Also liked the outdoor kitchen with tv. Elevator was helpful for my dad who has difficulty with stairs. Floors all tile or wood which makes easy sand clean-up. We are delighted to hear how much you and your family enjoyed your vacation! 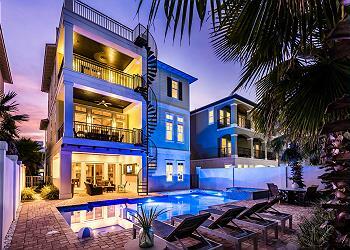 We agree that this home in Miramar Beach is a perfect spot to enjoy a relaxing beach getaway. We look forward to having you again soon! Wonderful home in a great location! 21 people spread out nicely. Luxurious home and attentive management. Great pool area! We are so thrilled that you enjoyed your stay in this beautiful home! It is the perfect place for a fun summer getaway. We hope to see you back at the beach again soon! We are so happy that you loved this amazing home as much as we do! It truly is everything that you said and more. We hope to see you back at the beach soon! What a beautiful sunset! We were thrilled to be able to help you during your stay. We loved having you with us and hope to see you back soon! We had a fantastic time in this property. Beautiful, spacious home with a great pool/spa outdoor area. We loved being a short walk to the beach, local coffee shop, DQ and shops. The golf cart was a hit, too! What a darling photo! It's definitely one to frame and look back on as they all grow up! We couldn't be happier that you had such a fantastic stay with us, and enjoyed the property so much! The outdoor space is perfect for entertaining groups of all ages! Thank you so much for choosing 360 Blue for your beach escape. Be sure to come back and see us again soon! We had a wonderful time! This house is amazing! Very spacious, and we loved the pool and outdoor area! Had a little emergency with the air conditioner going out but was fixed in a very timely manner! We are so thrilled to hear that you had a great stay and that our maintenance team was able to act quickly and get that AC issue taken care of for you. We are grateful you chose 360 Blue and we hope to see you back soon! This property was phenomenal! Perfect for a family getaway and conveniently located to Shopping, restaurants, and beaches! Would recommend to everyone and will definitely rebook! Thank you for the exceptional service! We are thrilled to hear you enjoyed the property and your stay with us so thoroughly. The location of this home really is so convenient to all of the great restaurants and shops in Miramar! Thank you so much for choosing 360 Blue for your beach escape. Come visit us again soon! This is the 3rd time we have stayed on this street. We were here when they were building this home, and could not wait to stay here. Needless to say, we were not disappointed. Everything was even better than in the pictures. Such a beachy and comfortable feel to it. The pool was great, as we had a 3 year old, and the ledge worked out perfect for her, the water was always warm and comfy. The rest of the kids loved the bunk rooms with the built in TV\'s. Only a short walk to the beach, BA coffee, and DQ. Close to groceries, shopping, restaurants, and very convenient to anything you might need. The only problem we had was with the internet, and the cable company was there 3-4 times, and never could get everything to work completely. As for the pool alarm, it is a state law, and it is annoying, but with little kids, it\'s just a nice reminder to keep an eye out for them.If you are looking for a beautiful place to stay, with lots of room for everyone, this is the place. We had 14 of us, 9 adults and 5 kids, and still had plenty of room. We love this area, and will be back!! This is an Awesome property. We stayed at this property shortly after it was built in August of 2013. The house itself is fabulous. Location was so close to the beach. Management was very friendly and helpful. Would highly recommend! \"To celebrate my 60th I wanted a place that would hold 8 adults and 9 children ranging from 2-14. Couldn\'t have picked a more wonderful place. Everyone was just thrilled with your beautiful house. The bunk beds with the built-in T.V.\'s are fantastic. The pool was amazing. Glad we heated it for November because the kids would have been in it no matter what. The hot tub area was a great meeting place at night while one family did the cooking. Washer on first floor broke first time we used it, so thank goodness there was one on the third floor. Would be nice to see on the website, exactly how bedrooms were laid out with what size beds, etc. on each floor for reference before hand, but it all worked out. Mattresses were a little soft for our liking but really can\'t complain about anything else. Love the way the kitchen is laid out with all the room for meals with that many people. The walk to the beach was very short. The beach is beautiful and empty Thanksgiving time. Kids had a blast on the beach!!!! Also loved the idea of the pool alarm to warn us if any little ones got out by the pool with adult supervision. All in all, we would return in a heart beat!!!! !\"
We were looking for a place close to the beach and had a pool! We were not disappointed! This house is in a perfect location and so beautiful! Plenty of room for the 16 of us! We had 8 adults and 8 older kids! The pool table was a great addition! Thanks for the making this family trip a great and stress free one! For our visit, we had five families, totaling 20 people, in the home to celebrate my parents 50 wedding anniversary and we couldn\'t have been happier with our choice. This home, simply stated, is amazing and the pictures on the site do fully capture the scale and beauty of this property. We were completely overwhelmed with how amazing this house was at every turn. The thought that went into the design of this property is clear as soon as you walk through the front door. No detail was missed! The large kitchen never felt crowded, there was plenty of indoor and outdoor seating, different living areas, a perfect sized private pool and hot tub, amazing views from the rooftop deck, and more than enough sleeping space. One thing that was not clear to me from the pictures is that there 2 separate kids rooms with a total of 10 individual, spacious built in bunks with a privacy curtain and each bunk had its own TV. The kids loved it! We absolutely would have enjoyed our time together as a family without every having to leave the house and pool area! That said, the private beach area was absolutely gorgeous! It was easy to see how this area earned the \"Emerald Coast\" nickname. And while the home is about a block from the beach, it was an easy walk and I actually loved and preferred the quiet, palm tree lined street with absolutely no traffic in front of the property. There is also several restaurants and shops within walking distance and with a ton of fun things to do and lots of shopping within a few minutes drive. The owner was also great to work with and very responsive to any questions we had both before and after our arrival. We would absolutely return to the home and area!\"
This home was perfect for our 3 families with small children and my parents. It is a gorgeous home, within very close walking distance to the beach. Our families loved the large pool and hot tub, as well as the wonderful kitchen with all the extras you would need! The kids really, really enjoyed their individual televisions in each of the bunks, and the parents loved the pool table and outdoor sitting areas. We could not have asked for anything extra - it was all provided! !